The native of Arizona had been very active in providing humanitarian relief throughout the Middle East region for the past few years. Prior to her work with Syrian refugees, Ms. Mueller was a solidarity volunteer in Palestine. Many Palestinians are speaking out about her death at the hands of Da’esh (ISIS). ‘Kayla was drawn to help those displaced by the Syrian civil war. She first traveled to Turkey in December, 2012 to provide humanitarian aid to Syrian refugees. She told us of the great joy she took in helping Syrian children and their families. ‘We are so proud of the person Kayla was and the work that she did while she was here with us. She lived with purpose, and we will work every day to honor her legacy. ‘Our hearts are breaking for our only daughter, but we will continue on in peace, dignity, and love for her. 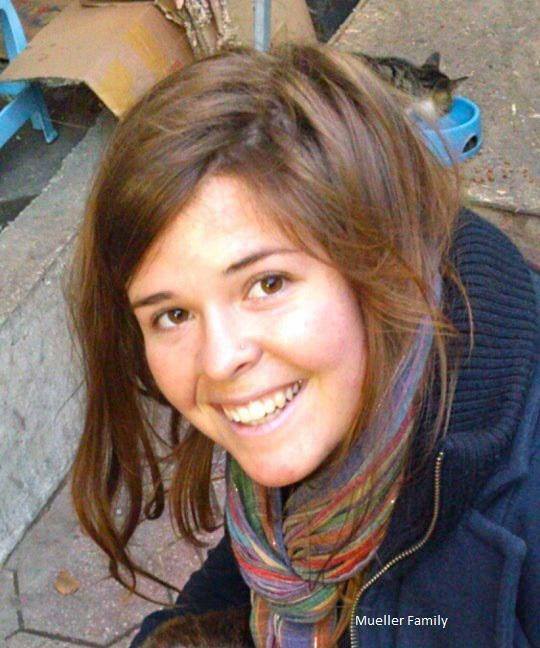 In addition to the family’s statement, the Mueller’s also released a handwritten note they received from Kayla while she was held hostage by Da’esh. The letter has been transcribed for clarity. 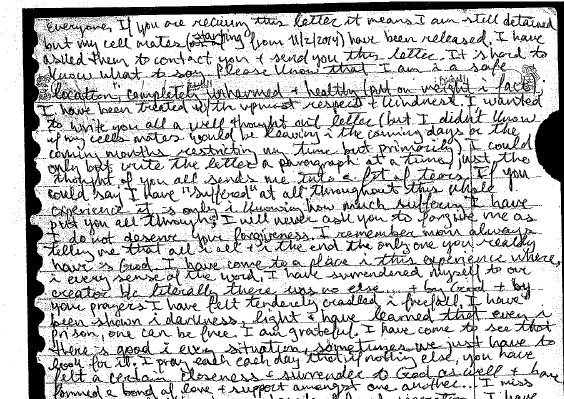 Everyone, If you are receiving this letter it means I am still detained but my cell mates (starting from 11/2/2014) have been released. I have asked them to contact you + send you this letter. It’s hard to know what to say. Please know that I am in a safe location, completely unharmed + healthy (put on weight in fact); I have been treated w/ the utmost respect + kindness. I wanted to write you all a well thought out letter (but I didn’t know if my cell mates would be leaving in the coming days or the coming months restricting my time but primarily) I could only but write the letter a paragraph at a time, just the thought of you all sends me into a fit of tears. If you could say I have ‘suffered’ at all throughout this whole experience it is only in knowing how much suffering I have put you all through; I will never ask you to forgive me as I do not deserve forgiveness. I remember mom always telling me that all in all in the end the only one you really have is God. I have come to a place in experience where, in every sense of the word, I have surrendered myself to our creator b/c literally there was no else. + by God + by your prayers I have felt tenderly cradled in freefall. I have been shown in darkness, light + have learned that even in prison, one can be free. I am grateful. I have come to see that there is good in every situation, sometimes we just have to look for it. I pray each each day that if nothing else, you have felt a certain closeness + surrender to God as well + have formed a bond of love + support amongst one another I miss you all as if it has been a decade of forced separation. I have had many a long hour to think, to think of all the things I will do w/ Lex, our first family camping trip, the first meeting @ the airport. I have had many hours to think how only in your absence have I finally @ 25 years old come to realize your place in my life. The gift that is each one of you + the person I could + could not be if you were not a part of my life, my family, my support. I DO NOT want the negotiations for my release to be your duty, if there is any other option take it, even if it takes more time. This should never have become your burden. I have asked these women to support you; please seek their advice. If you have not done so already, [REDACTED] can contact [REDACTED] who may have a certain level of experience with these people. None of us could have known it would be this long but know I am also fighting from my side in the ways I am able + I have a lot of fight left inside of me. I am not breaking down + I will not give in no matter how long it takes. I wrote a song some months ago that says, ‘The part of me that pains the most also gets me out of bed, w/out your hope there would be nothing left…’ aka-The thought of your pain is the source of my own, simultaneously the hope of our reunion is the source of my strength. Please be patient, give your pain to God. I know you would want me to remain strong. That is exactly what I am doing. Do not fear for me, continue to pray as will I + by God’s will we will be together soon.